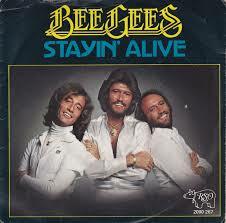 ‘Stayin’ Alive’ was stayin’ at number 1 as it enjoyed its 5th week as the nation’s favourite. It was the 51st song to clock up at least 5 weeks at the top of the charts. The Bee Gees were now equal top of the list of weeks at 1 by an act as they joined The Sweet on 19. Kelly Marie’s ‘Make Love To Me’ enjoyed a second week at 2 while the Bee Gees’ ‘Night Fever’ and ‘How Deep Is Your Love’ switched places with the former climbing to 3 and the latter dropping to 5. This gave us the second and final week where an act had 3 of the top 5 hits and The Bee Gees were the only act to manage this. Uriah Heep picked up their first climber of the week award with a 4 place climb by ‘Lady In Black’. This mean that all the women in black dresses who had charted so far had taken the climber of the week. The other two women in black were The Hollies’ ‘Long Cool Woman In A Black Dress’ and Mungo Jerry ‘Long Legged Woman Dressed in Black’. ‘Lady In Black’ was the only star rater this week. After the 6 songs taking faller of the week last week we were down to just 2 managing it this week. Debby Boone’s ‘You Light Up My Life’ fell 3 from 14 to 17 and Neil Diamond’s ‘Desirée’ fell from 9 to 12. Wings’ ‘Mull Of Kintyre’ became the 10th song to clock up 9 weeks as the oldest on the charts as it held on to the title with 21 weeks to its name. Its co-oldest on last week’s chart, Clout’s ‘Substitute’, was one of three songs to depart the chart. It had managed 20 weeks in the charts and spent 8 of those at the number 1 position. There would be more to come from them. We also said goodbye to Judy Cheeks’ ‘Mellow Lovin’ which spent 15 weeks on the charts and peaked at 5. Judy would return to our charts at a later date. Last of the leavers was Uriah Heep’s ‘Free Me’ which lasted 18 weeks and peaked at 3. They had only had 1 week with 2 hits in the charts and as mentioned above, their other hit, ‘Lady in Black’, was taking the climbing honours. Suzi Quatro had already had 8 songs chart in the UK (including 2 number 1s) before she finally set foot in our charts with ‘If You Can’t Give Me Love’. The song would be her 5th top 10 hit in the UK, going to number 4 there. However, in her native America she was struggling to make an impact. By the end of 1978 she had only had 2 Hot 100 hits, with her best peak being the 56 that ‘Can The Can’ managed. ‘If You Can’t Give Me Love’ finally managed to get to 45 in the US in 1979. The song fared well in Europe getting to 2 in Belgium, 4 in Holland and Switzerland, 5 in Germany, 9 in Austria and 12 in Sweden. It also managed to get to 14 in New Zealand. For song writers Mike Chapman and Nicky Chinn (who were already represented in our charts with Smokie’s ‘For A Few Dollars More’) this would be their 16th hit and would move them up to tied 9th place on the list of number of hits by a song writer, sharing the spot with Neil Diamond. Our second new entry was a tribute to painter L.S. Lowry. Michael Coleman and Kevin Parrott went under the name Brian & Michael when they recorded the song ‘Matchstalk Men And Matchstalk Cats And Dogs (Lowry’s Song)’. The ‘matchstalk men and matchstalk cats and dogs’ was a reference to the style in which Lowry painted. The song would go to the top of the UK charts, knocking Kate Bush’s ‘Wuthering Heights’ off that spot before spending 3 weeks there itself and finally being removed by our number 3 song this week, The Bee Gees’ ‘Night Fever’. The children’s choir on ‘Matchsalk Men…’ was the St Winifred’s School Choir who would top the UK charts a little over 2 years later with ‘There’s No One Quite Like Grandma’. Barry Manilow returned to the charts for a 3rd outing, this time with ‘Can’t Smile Without You’. The song was written by Chris Arnold, David Martin and Geoff Morrow who had brought us the 1975 hit for Guys & Dolls, ‘There’s A Whole Lot Of Loving’. The Carpenters had recorded ‘Can’t Smile Without You’ in 1976 and released it as the b-side of ‘Calling Occupants Of Interplanetary Craft’, but it was Manilow’s version that went up the charts, getting to number 3 on the Hot 100 in the US and scraping a peak of 43 in the UK. Manilow shared production credits on his version with a certain Ron Dante who had been the lead singer in the successful late sixties/early seventies band The Archies. It had been 103 weeks since Manilow had last been seen in the charts and he was the 95th act to have seen a gap of 100 or more weeks between hits. 10 of the 95 had seen this twice. After sitting on 19 for the last 3 weeks, the gap between the number of hits we had seen from American acts and those from British acts went back to 20 with the Yanks on 493 and the Poms on 473. The departure of Clout from the top 20 meant that we were just left with Clive Risko’s ‘Bluest Heartache of the Year’ flying the local flag in the top 20. It had been 61 weeks since the local hit count was this low. Both Kelly Marie and Uriah Heep reached the 20 weeks in the chart mark while on the points front, The Bee Gees became the second act to pass the 2,000 points mark as they moved on to 2,035, leaving them 135 behind Tom Jones who led the way. They clocked up 54 points this week which meant just 3 more weeks like this and they would pass Tom. Neil Diamond saw his total move past 1,300 and he sat 9th overall with 1,309. With ‘Matchstalk Men and Matchstalk Cats and Dogs (Lowry’s Song)’ entering the charts we now had 8 songs in the top 20 that had topped the US and/or the UK charts. It had been 101 weeks since this count was this high. This entry was posted in 1978 and tagged Bee Gees, SA Top 20, South Africa, Springbok Radio, Stayin' Alive, Staying Alive. Bookmark the permalink.